I was lucky enough to stumble upon two OPI Designer Series shades not that long ago that were being sold for £8 each - half the price that I've seen them sold for everywhere else! So naturally, they had to come home with me. These colours aren't linear holographics like some of the older DS ones, but they're pretty glorious all the same. I believe they originally came out in 2008, but both are now part of the OPI DS permanent line. 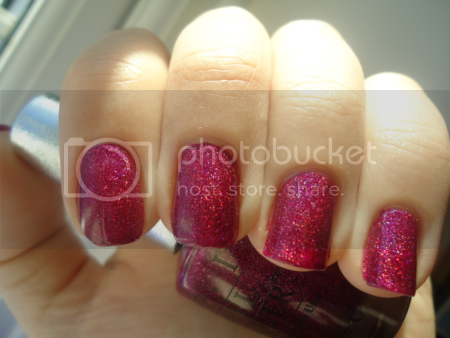 First I have Extravagance, which is a rich berry purple with a scattered holographic shimmer. I can't even begin to describe how lovely this colour is. I'm a sucker for purples anyway, but this one is truly special. The first two photos were taken in the sun; the third in the shade. Even indoors it looks incredible! The other shade I have is Reflection. 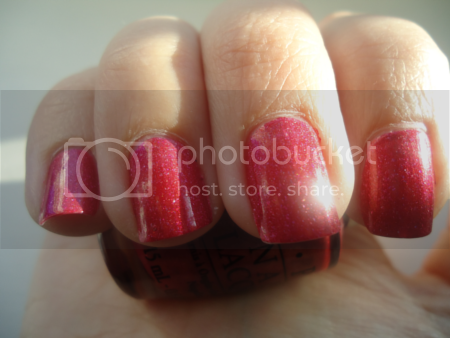 It's very similar to Extravagance in that it has a subtle holographic shimmer, but the colour itself is hot pink. I don't like it quite as much as I do Extravagance, but that's really only because I prefer purples to pinks in general. I can't tell you how many compliments I received when I wore these two polishes. They're simply stunning, and would suit most skin tones. Yes they're expensive, and I'm not sure I would ever pay £16 (!) for them, but if you happen to find them anywhere for less than that, I highly recommend you snap them up!